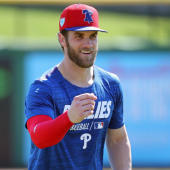 Franco is on the bench for Sunday's game against the Mets, Jim Salisbury of NBC Sports Philadelphia reports. Unless he enters as a substitute, the off-day will be just Franco's third since June 20. After seeming to be losing his job earlier in the season, Franco has completely turned things around, hitting .331/.371/.577 with 11 homers and 25 RBI over that 49-game stretch. Asdrubal Cabrera will slide over to third base Sunday, with Scott Kingery starting at shortstop.